Our Early Years Programme is designed to meet the needs of young learners from the age 2.6 and above. In a safe and caring environment, our dedicated educators ensure that our youngest become happy and confident learners who succeed in gradually entering the realm of letters and numbers. 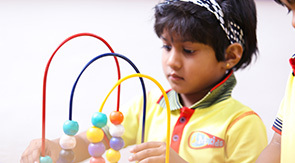 The Montessori curriculum is designed for preschool and kindergarten students focusing on Play Based Learning and cognitive development, this is the time when children use their bodies, senses, and emerging problem-solving skills to learn about and make sense of their world in the ways most meaningful and effective for them. Dr. Maria Montessori was one of the first educators to recognize that the first few years of a child’s life are critical to the development of personality and intellect. Through scientific observations, she determined children learn best at their own pace and given the choice of activities. On the other hand, the focus of IB is on the natural development of children as well as the close relationships that they share with their environment. The IB curriculum is Integrated, Differentiated and Trans-disciplinary and accentuates the interconnected learning that occurs when children are exposed to real-life situations in the classroom, home, school, and their community. It caters to each and every individuals special learning abilities targeting their multiple intelligence. Our Pre Kindergarten program helps children broaden their base information, form concepts, acquire foundation skills and positive attitudes to learning, and begin to develop their abilities and talents in a wide range of areas. Our Lower Early Years is not only the foundation for a happy and successful school career, in this year the children also develop many social, personal and emotional skills like interacting with other children, sharing toys, expressing their feelings in an appropriate way, waiting for their turn or becoming more independent when dressing and eating. The curriculum focuses on Reading and Language, Writing, Understanding of the World, Confidence and Public Speaking, Self Expression, Science and Technology, Mathematics, and Logic and Reasoning. The learning is imparted through the inquiry methodology and is interacted and play based where students explore and think critically. 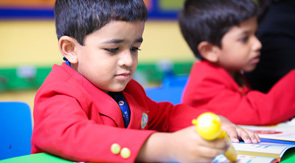 At M- Kids we believe in a holistic approach that caters for each child’s learning needs. At this stage the focus is on the development of concepts, competencies and character. Character development is equally important to the development of competencies and conceptual understanding. Our UKG program focuses on guided inquiry, collaboration and communication as approaches to teaching and learning. Learning is defined as the process that leads to demonstrable consolidation or extension of conceptual understanding, competencies or character. This program focuses on four fundamental development areas – Cognition, Language and Communication; Personal, Social and Emotional development; Creativity and Imagination; and Physical Development. Our learning methodology focuses on three main educational approaches Integrated, Differentiated and Trans-disciplinary Learning Through Inquiry, Learning Through Play, Integrated, Differentiated and Trans-disciplinary learning Students grab ideas efficiently and effectively and maintain their attention in school when they have an educational program that is integrated – one that compels them to connect their learning to their own lives and the world around them, and that helps them see how knowledge and skills in one area are relevant and related to the other. Our Kindergarten experience accentuates the interconnected and trans-disciplinary learning that occurs when children are exposed to real-life situations and differentiated activities in the classroom, home, school, and their community- catering to each and every individuals special learning abilities targeting their multiple intelligence. Almost all young children are naturally inquisitive and ask many questions about things that holds their attention. Our program capitalizes on this natural eagerness to learn and absorb information. Young children are given plenty of opportunities to manipulate materials, to observe, listen, investigate, experiment, and ask questions, as well as draw conclusions. Our teacher’s help children make real life connections between what they already know and what they are discovering and learning. From birth, play is the way children inquire and learn about the world around them. Play based learning looks at the importance of time, space, materials and relationships in inquiry. It has been long acknowledged that there is a strong connection between play and learning for young children. Play, therefore, has a legitimate and important role to play in Kindergarten and can be used to further children’s learning in all areas of our educational program. A look at the M- Kids Approach M- Kids values each child as strong, capable and resilient; rich with wonder and knowledge. Our approach to teaching young children puts the natural development of children as well as the close relationships that they share with their environment at the center of its philosophy.